Monthli is revolutionizing HOA community management software. Scroll down to find out how or jump right in and sign up for free! 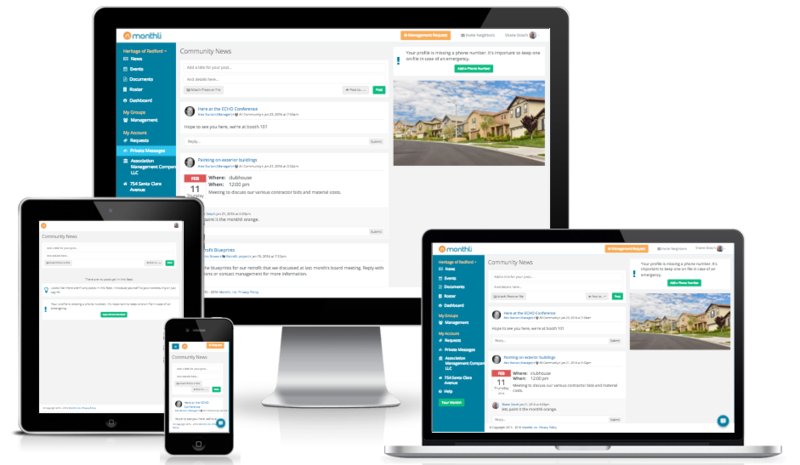 The fastest growing HOA community management software in the industry. But that's madness! How can we do that? We provide your community or management company with best-in-the-industry software that in the future will provide optional paid services. We will also make money through ancillary services, like helping you produce escrow documents, find better and less expensive insurance, and introducing your association to the best vendors and service providers in your area. And rest assured, your data is safe with us. We will never share your data with anyone. We promise! Our platform uses bank-level encryption on secure servers hosted by Amazon Web Services, the leading cloud server provider in the world. Any questions? Feel free to contact us at anytime by email: hello@monthli.com or phone: 844-777-2233. Save time ​and money with ​integrated tools: member communication, accounting, work order & roster management. Monthli is working hard to make managing your properties more efficient so you can focus on providing great customer service. Get control and transparency into your association's operations with tools to manage board business, documents & maintenance histories. Monthli makes it easy for association members to engage with their board & management. File a maintenance request, pay your dues, and communicate with fellow community members. You can even report issues from your smartphone! Fast and easy to onboard all community members. Members can update their profile anytime from phone or desktop​. Easy to engage with all owners or specific residents per their communication preferences. Keep dialogue productive with Board moderation tools​. Store and share association documents online. Use our physical mail delivery service of documents and violations when needed. Residents can file maintenance requests easily and get notified as they are updated by management. Maintenance history is applied to the property for easy future reference. Keep the community informed of important events and board meetings. Members are notified as events are created and as they approach. Monthli sends notifications to users as new posts, events, and maintenance requests are updated. Never be left in the dark about what's happening in your community. Adjust notification frequency to your liking. Community data is safe and secure using bank-level encryption. Control who can see what using simple, but powerful group access controls. Understand the state of your community through powerful reporting functionality. All of your records are stored online in the cloud. Make transitioning between board members a breeze. No more banker boxes! Interested in trying out Monthli for FREE? Sign up now with no obligation. By signing up, you can test drive Monthli for your management company or HOA. We can even import your rosters to save you time. Invite board and community members to help you test it. And feel free to contact us at any time to get a demo or to answer any questions you may have. "Keeping our current roster was a pain. Now it's simple because Monthli makes it easy for everyone to keep their info up to date." "Ticket tracking in Excel was hard. With Monthli it's easier and generating board reports is a snap. Also love that I can update any ticket from my phone!" "Can't believe we used Yahoo! Groups for so long. Monthli is a much better way for our association to communicate. Thank you!" "AWESOME! I am so glad we are able to use your application. Great interface and super user friendly. Keep up the good work!" Monthli, Inc. All rights reserved.